One of the oldest tarot decks ever created, the Sola Busca is known for its alchemical symbolism and for having inspired many of the minor arcana of the Rider Waite Smith deck. The first entry in Lo Scarabeo's Anima Antiqua (Ancient Soul) series, this deck is now available as a deluxe, oversized kit with a guidebook in a premium hardbox. These cards, printed on premium cardstock, have been lovingly printed with great care from originals found in the greatest collections of rare tarot decks. 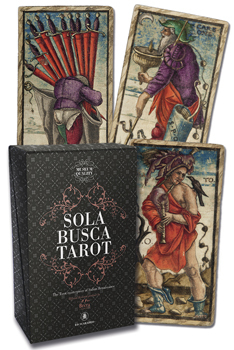 Previously sold as a limited-edition deck, this new museum quality kit enhances the Sola Busca experience by providing the history behind the deck as well as card meanings and spread ideas. Boxed kit (9.25 in x 7.25 in) includes a 78-card deck printed on premium cardstock and a 144-page guidebook, all packaged in a deluxe box.